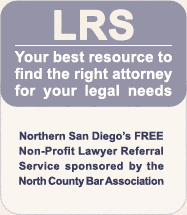 The Lawyer Referral Service is the only non-profit legal referral service sponsored by the North County Bar Association. It has been referring callers to some of San Diego’s finest attorneys for more than 23 years. To assist Spanish-speaking callers, the LRS also has a bilingual counselor available. Panel attorneys have experience in more than 17 areas of the law. Each call is carefully screened by trained counselors to assure a referral to the right attorney. Prospective clients receive a free, half-hour consultation with an attorney to review their legal issue and discuss fees. If you need a referral, the best way to proceed is to call the Lawyer Referral Service at (760) 758-4755 between the hours of 8:30 a.m. and 5:00 p.m., Monday through Friday. If you prefer, you can submit a request directly via this site.